I was so worried at first discussing my wedding over email and how I wanted everything. Ellie made me feel so comortable and the decorations were AMAZING. I couldnt thank her enough for an amazing service, the decorations on the day and her prompt responses. Everything Covered is an amazing business with loads of beautiful decorations to choose from. Wish Ellie all the best with her company. Everything Covered provided an aisle runner, hurricane vases with candles and a post box for cards for our wedding March 2016. 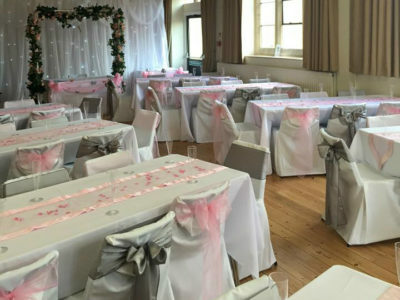 The were a really easy company to work with and the items supplied were of great quality and added a lovely effect to the overall look of our wedding. We were very pleased with their level of customer service and would highly recommend them to any future bride/groom. Thank you again for all your help! After looking at many companies Ellie’s was by far the one that stood out. She listened and understood everything we wanted and made our wedding day feel as though it was as important to her as it was to us. I couldn’t believe how amazing the venue looked and still to this day am amazed at how beautiful it was. Our guests are still talking about it now, a month later. I will most definately be recommending Everything Covered to all my friends planning their weddings! HUGE thank you again Ellie! I really can’t praise Ellie at Everything Covered enough for the fantastic job she did. 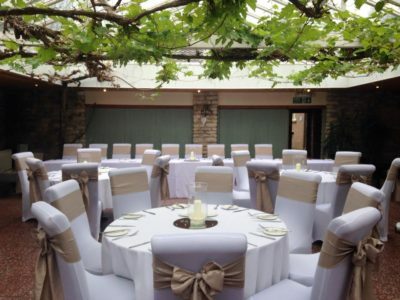 The venue decor and chair covers were just stunning for our wedding at The Compass Inn. Ellie is extremely helpful and this made the planning of the day hassle free especially as I live 180 miles away from the wedding venue, and prompt replies with emails. 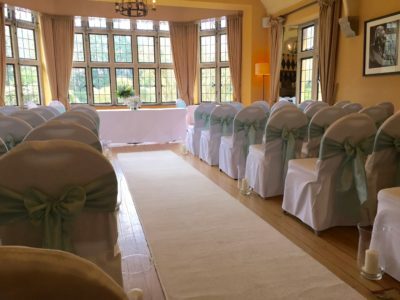 The day was everything we wanted it to be and more we had endless comments on how beautiful the venue looked. We would recommend Ellie to family and friends as the service provided really is 5 star! Jon and I wanted to take the opportunity to say a massive thank you for all that you did for us to make our wedding as special as possible! 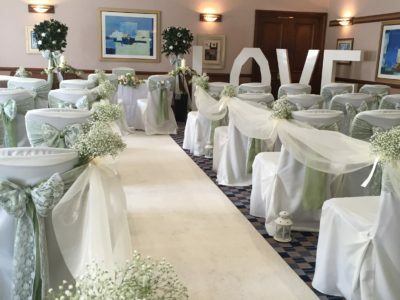 The venue looked absolutely beautiful…from the ivy on the banister to the giant love letters! You well and truly blew us away! 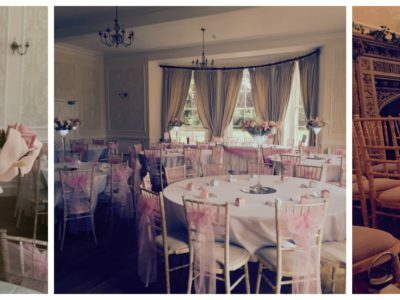 The lace chair covers and swagging really in-captured our theme – which I feel you understood for the day we met! You have a true talent! The aztec staff said it was the most stunning the venue had looked – was is amazing! I can only apologise for the over run as the ceremony began later than planned as did the photos! But your understanding and support to turn the room around made sure that the evening guests got to enjoy it too, which we are so grateful for! They have also posted these pictures on their facebook page. Would highly recommend your services and wish you all the best for the future! Thank you for making our day so special!